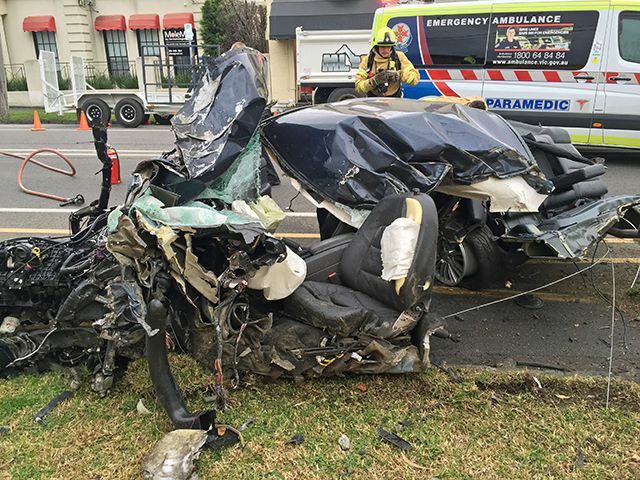 According to the Herald Sun, a car may have been travelling at over 100km/h when it slammed into a pole on Tuesday evening in the Melbourne suburb of Brighton. After colliding with the pole, the vehicle hit five other cars at a service station. It is believed that the man driving the Ford experienced either a stroke or a seizure shortly before the crash. Authorities arrived at the service station on Park Street around 3 pm. CCTV from a shop nearby captured the accident. In the video, the car is shown driving at high speed and slams into a pole before crashing into other vehicles. A man in his 50’s was taken to the hospital to be treated for a broken arm and leg injuries, and a man in his 30’s was treated for pain in his back, neck, and chest. It was reported that both men were in stable condition at the Alfred Hospital. Three other people were treated for various injuries before they were taken to a hospital according to an Ambulance Victoria Spokesperson. Our very own, Ryan Moran and Carolyn Blyth were at the scene to assist. There are six basic steps that you should follow if you experience a TAC accident. By following these basic steps, you will vastly enhance the opportunity to obtain compensation for any injuries suffered in the accident. If you are in any motor vehicle accident where an injury has occurred, report the accident to the police as soon as can – no matter how minor the injury appears to be at first. The TAC legislation requires an accident be reported to the police before the claim can be accepted. You should do so even if you cannot identify the other vehicle involved in the accident. If the accident involves a train or a tram, report the accident to the train or tram driver or operators as soon as you can. Again, TAC legislation requires it to be reported. Although the legislation does not mention buses, we suggest that you do the same with any accident on a bus and report it immediately to the driver or the bus company. Inconsistent versions of the accident being given later to the TAC or health providers. Your short and concise version should also be used when you report your accident to the TAC. Some people are unsure as to whether they should make a claim after experiencing a TAC accident. We strongly recommend that a claim be submitted as soon as possible, regardless of the extent of your injury. The TAC is your insurance company in essence. It is there to provide you, a member of the Victorian community (as well as guests to our state), with support whenever you are injured in an accident by reason of driving a motor vehicle. The scope of the benefits provided under the “no fault” concepts of the legislation are very expansive and can cover so many aspects of your future needs if you are injured. As an example, the legislation can provide for benefits including: attendant care services, child care services, various forms of medical care, medications, home modifications, educational assistance and occupational physiotherapy – just to name a few. The TAC “no fault” benefits for medical and related expenses are there for your life – regardless of if you require them right away or if you require those benefits 20 years later. In other words, so long as your claim has been accepted, it is your insurance policy for life. The TAC scheme can only provide you with no fault support if you file a timely claim form. The legislation requires the claim to be made within one year after the transport accident has happened. If not made in time, the claim will not be accepted. If you do not get a claim accepted by the TAC within the time period required, you will not be able to get any common law compensation if your injury later on seriously affects your life and your ability to work. This means that your decision to not submit a claim form will not only prevent you from getting no fault supportive benefits for life, but it will also prevent you from getting any common law lump sum compensation against someone who has caused you to suffer your serious injury. The TAC claim process usually starts with a call to the TAC to say you have had an accident. If you have been hospitalized, someone may seek to have your claim form submitted while you are still in the hospital. Eventually, you will be asked to look over the TAC claim form and sign the form at the end. The form will contain a section that asks you to describe how the accident happened. Some people give long explanations of how the accident happened on the phone or to the hospital, and the person filling in the form will write what they think has been said. Do not accept the description given by others. If needed, give your own clear and concise description of what happened – the same short, concise version that you gave to the police when you reported the accident is ideal. You may ask what difference does it make what is said, as long as the claim is accepted. The TAC operates in two separate roles. At the time when you are putting in your claim form, it is operating as a government agency – there to help you with no fault benefits. Later on, it takes on a different role and one that is essentially against you. In that role it will operate as a commercial insurer, defending the interests of the person you say was responsible for the accident. It will gather whatever information it has available to prevent or diminish the value of your common law compensation claim. That is when it will turn to what you have said happened in your accident – in your claim form and anywhere else – to see if what was said can be used against you. It can be difficult for people to keep in mind the second role of the TAC when the TAC is being so supportive at the start. That is why it is vital to remember at the outset that everything you say and do may be used in that defence later on. In summary, when it comes to the TAC claim form, a simple, concise and accurate statement of the accident is all that is needed to get your claim accepted. A long and complicated explanation may lead to confusion as to what you meant to say, and to inconsistent versions being recorded by those who attend to you over time. So our suggestion is to create and consistently use a short, concise and accurate description of your accident. The TAC scheme is meant to provide support for all of the injuries you have suffered in the transport accident for the remainder of your life. It makes no difference when the injury manifests itself – it can be immediately, such as with a badly fractured leg, or later on, such as with damage to a kneecap caused by striking a dashboard in the accident. The TAC claim form asks you to detail the injuries you have suffered. It is often the source of difficulty when the injuries noted are only those that were picked up right after the accident, but not those that later developed. The law does not limit the scope of support to the injuries listed on the TAC claim form, and will allow someone with appropriate medical support to get assistance for injuries that develop later on. As a general precaution, and to avoid any inappropriate focus on what is said on the claim form, it may assist to simply add some words to indicate that you may develop other injuries in time. This would be quite a reasonable way of looking at the consequences of a serious motor vehicle accident where your mind and body have to come to terms with any changes over time. While we cannot tell you what to indicate on your claim form, you may wish to consider whether you are likely to develop additional injuries in time. If so, use whatever expression you find appropriate to communicate that time may have much to say about your wellbeing and need for TAC support. The TAC claim form has expanded over time, and one of the sections that now seeks considerable information is that which deals with a person’s past medical history. The section has a lot of questions that ask about a possible past history of such things as, for example, head injury or lower back injury. Although you may wish to get the claim form in as fast as possible, take the time to make sure this section gets filled in correctly. If there is any history or if you even think there may be some history, you may wish to say so as what really matters is not to be seen to be trying to hide something. The TAC will eventually seek copies of your past medical history and will ask for medical reports from your doctors. In doing so, your complete medical history will become known. Some people think that something that may have bothered them 20 years ago and only for a short period of time is really not important at the time of a serious car accident, but it may become important if that part of your body suffers after the accident. It is therefore best to give a detailed past history so that it can be clearly seen that your current problem truly does stem from the car accident. If you struggle to remember all of your medical history, just say so. Seek the assistance of your treating general practitioner to get the details and give them to the TAC as soon as you can. What the TAC is looking for is clarity in what it has to assist you with because of your accident and what it does not have to assist you with because of it being unrelated to your accident. The generous common law compensation available to those who suffer a serious injury and can establish that someone else is at fault for their accident – in whole or in part. Explain the TAC scheme in simple language and guide an injured person through its many no fault benefits – both immediately after the injury and for the rest of a person’s life. The relationship that is created is one that allows a good personal injury lawyer to work for you for the remainder of your life. Seek to find an early, peaceful resolution to your common law compensation claim, and still achieve you an excellent outcome. Tell you when they may need to fight for you for longer so that they can seek you the extra compensation you deserve from your own insurance company. Those funds will be needed by you and your family for the remainder of your life. You cannot come back later and ask for more, so it is the one important contest where you need to have someone on your side that is devoted to your best interests. Without any cost until they are successful with your compensation claim. Without any cost to you to challenge any TAC benefit decision on an informal or formal basis. Without any upfront payment by you for disbursements. Without any need to engage in complicated financing arrangements that simply add to the cost of the legal services provided. How Much Compensation Do You Deserve After a Car Accident? Lump-sum benefits if your accident-related injuries caused permanent impairment. Replacement of lost earnings caused by the inability to work while recovering from your injuries. Payment of reasonable medical expenses to treat injuries suffered in the accident. Payment of reasonable rehabilitation costs related to the injuries from the crash. Payment for in-home assistance made necessary by your injuries. If you suffered injuries that are thought to be “serious” in your car accident, and the crash was at least partially due to the fault of someone else, you may be entitled to lodge a common law damages claim with the TAC. The compensation available through a common law claim is often much larger than what would be available in a no fault claim. If you happen to be involved in a car accident in Victoria, having an experienced car accident lawyer help you in your case will ensure you get the compensation you deserve. Henry Carus & Associates understands the TAC will operate as an insurance company when defending a common law claim. In this situation, the TAC will defend the person who seriously injured you. Consequently, the TAC is not there to assist you in getting the compensation that you deserve. Because we have experience with the TAC as a client, we are prepared to contest its policies as your case requires and to prove your common law claim.